In order to conduct necessary upgrades to BitMEX servers and systems, the exchange will be down for maintenance on Sunday, November 22 from 12:00 UTC to 13:30 UTC. Any withdrawals must be confirmed by 12:00 UTC, and will be processed at 13:30 UTC. The best thing about learning how to trade global markets at a bank is that you get to learn lessons with other people’s money. I learned many $100,000 plus lessons in my first years as a trader. I learned that whatever come outs of your mouth (or from your computer terminal) must be owned by you, 100%. There are no do-overs, and the trade always stands. Being personally accountable for your PNL is the only way to gain the trust of your clients and colleagues. A trader fat fingered a market buy order on Gemini this past week, which resulted in the price spiking to $2,200. Gemini clearly stated in their terms of service they were not responsible for user error; however, because the client lost a lot of money they decided to reverse the trade. Savvy traders who placed high offers to take advantage of these situations were stiffed. Gemini claims to be the exchange where professional investors will buy and sell Bitcoin. The exchange will possibly be used as the market for their planned ETF. However, if the SEC is still paying attention to Gemini, this incident has stalled the approval process further. Exchanges like the New York Stock exchange have clear procedures around Clearly Erroneous Executions. In the linked document, the NYSE explains exactly under which circumstances a trade can be busted due to trader error. Gemini only specifies that during a system failure trades may be cancelled. Gemini presents no guidelines on how a trade due to customer error can be cancelled. However, the Gemini terms of service explicitly state that Gemini is not responsible for trader error while trading on their platform. These inconsistencies are why many traders took to Reddit, and flamed Gemini for their decision. From an outsider looking in, it appears that a large client / friend of Gemini fat fingered and the exchanged bailed them out. I want to assure BitMEX customers that we will not engage in this sort of behaviour. If you click the Buy or Sell button, absent a system error, that trade stands. As the CNY devalues, my thesis has been that Bitcoin will become a more attractive asset to ordinary Chinese. Over the past 10 days, Bitcoin has nose dived from $500 to a low of $300. The PBOC devalued CNY by 0.65% during that time frame. The cause and effect between these two variables is broken or misunderstood. The relationship that continues to matter is the premium of Bitcoin in China. Over the same time period, the premium declined from over 10% to 1%. The price fell in line with the spread compression. If the spread begins to widen, it is a signal that the price reached a local bottom, and the climb to $400 can begin. CNY still stands stronger than 6.40, which is the lowest point for 2015. If the PBOC continues the devaluation beyond that point, it will be a strong signal that more severe devaluation is to come. 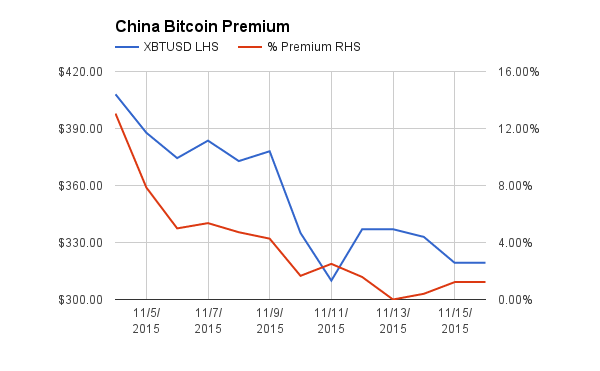 Between now and then, the relationship between the China Bitcoin premium and USDCNY will be noisy. The BitMEX 100x leveraged daily Bitcoin / USD futures contract, XBT24H, has traded at significant premiums to the spot price. Because XBT24H has a Bitcoin multiplier applied to a USD quoted Bitcoin price, the return in USD is quadratic. 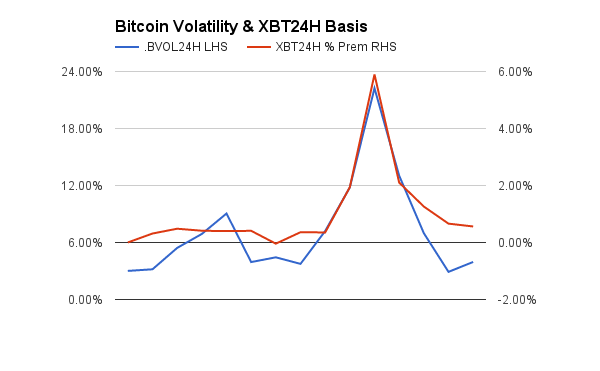 The nonlinear USD return (called gamma or convexity), means that as the intraday volatility increases, XBT24H’s premium over spot should increase. This function is by no means a perfect predictor. It should be used as a tool to frame what the fair price of XBT24H is. Based on a trader’s expectation of future daily volatility, he can plug that into the function and obtain a ballpark figure on XBT24H’s fair price. $300 was tested, and the price held. 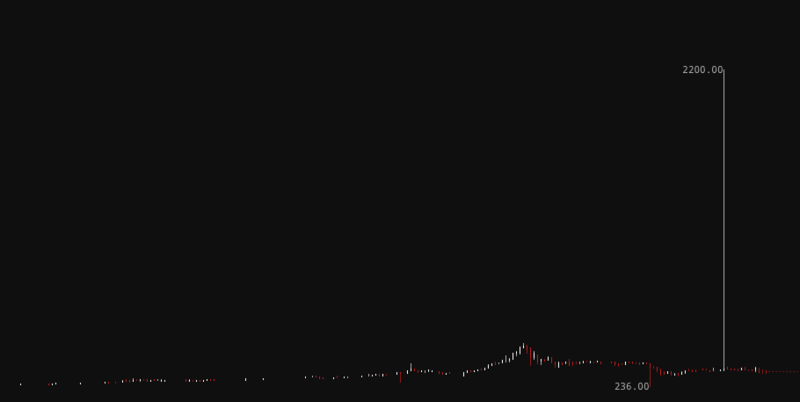 Shortly after, the price rebounded strongly to $330. The price is range bound between $320 and $330. More catalysts from China will be needed to take the price higher. 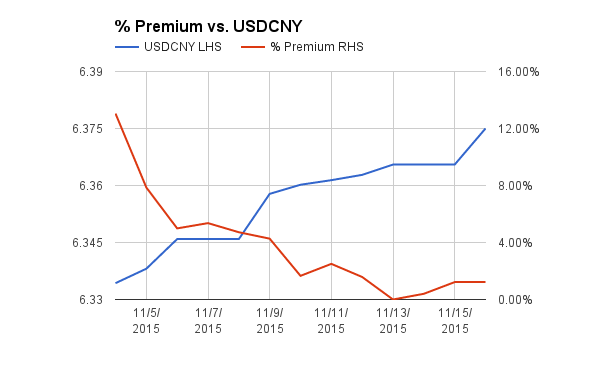 As mentioned before, USDCNY above 6.4 or a rise in the China Bitcoin premium will take the price higher. Buy the daily 100x leveraged Bitcoin / USD futures contract, XBT24H, while spot is $320 to $325 with an upside target of $335. Buy the weekly 50x leveraged Bitcoin / USD futures contract, XBT7D, while spot is $320 to $325 with an upside target of $350.